Optimize product designs and reduce time to market with FLOW-3D, a highly-accurate CFD software that specializes in solving transient, free-surface problems. 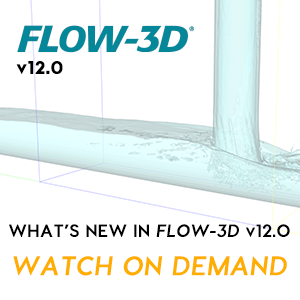 FLOW-3D‘s complete multiphysics suite includes our state-of-the-art postprocessor, FlowSight. FLOW-3D provides a complete and versatile CFD simulation platform for engineers investigating the dynamic behavior of liquids and gas in a wide range of industrial applications and physical processes. FLOW-3D focuses on free surface and multi-phase applications, serving a broad range of industries including microfluidics, bio-medical devices, water civil infrastructure, aerospace, consumer products, additive manufacturing, inkjet printing, laser welding, automotive, offshore, energy and automotive. A uniquely powerful, multiphysics tool, FLOW-3D provides the functionality, ease-of-use and power that helps engineers advance their modeling objectives. Built for the highest level of performance, FLOW-3D seamlessly scales from standard workstation solutions to hundreds of CPU core solutions on high performance computing cluster solutions. Need the highest performance? Faced with massive simulations? Overcoming runtime challenges? FLOW-3D seamlessly transitions from desktop workstation solutions to high performance on-demand cloud computing and cluster solutions to cater to the industry’s most demanding simulations. FLOW-3D delivers high accuracy simulation results faster by using our industry-leading algorithm TruVOF. A pioneering volume of fluid tracking method, TruVOF continues to set the industry standard for flow accuracy since its inception 35 years ago. FLOW-3D is the result of collaborating with the world’s leading scientific, manufacturing and research companies to deliver accurate simulations and an efficient, collaborative workflow. FLOW-3D employs our innovative meshing method FAVOR™ that dramatically improves problem setup by embedding the geometry directly into the mesh, allowing for rapid parametric adjustments without the labor-intensive remeshing required by other CFD software. Engineers spend their time visualizing, optimizing and collaborating on design concepts with leaner runtimes and more accurate results. FlowSight provides a powerful and simple method for understanding and sharing simulation results. Results can be compared by viewing both numerical and visual formats, analyzing iso surfaces from all six degrees simultaneously and linking and viewing separate cases together in the same viewport.